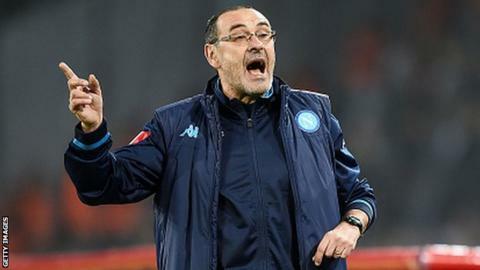 Inter Milan have accepted an apology offered by Maurizio Sarri after the Napoli boss made "highly offensive" remarks to Roberto Mancini. Sarri has been banned for two Italian Cup matches and fined £15,000. "We ask that the attention of the press and public now returns to the games in Serie A," read an Inter statement. Inter's statement added: "At the heart of Inter's foundation in 1908 is the belief that all players, no matter their nationality, language, religion, personal and social conditions and orientations, are welcome in the team and so was born the phrase 'brothers of the world'. "However, now is the right time to draw a line under recent events and put an end to the many discussions surrounding the last few minutes of the match. "Roberto Mancini and the club therefore accept the apologies offered by Maurizio Sarri and Napoli."